Another fair day with mild winds. In anticipation of stronger winds tonight and tomorrow, Captain Saleh ordered our inflatable boat to be brought on board. We have been towing it behind the ship for most of the voyage and have used it to conduct rescue drills, inspect the hull of the ship, and for photography. In heavy weather, however, it is safer to have it securely stowed on board. We are passing over one of the deepest portions of the Indian Ocean–4,200 meters. The water is crystal clear and brilliant blue in colour. A school of flying fish put on an impressive show of long-distance gliding this morning. A dozen small, striped pilot fish are now constant companions near the rudder and alongside the ship. In the afternoon we conducted an “abandon ship” drill during which everyone gathered at their designated life-rafts with whatever gear they were assigned to bring. The Jewel of Muscat might be a reconstruction of a 9th century ship, but we carry the latest safety equipment on board in case of an emergency. 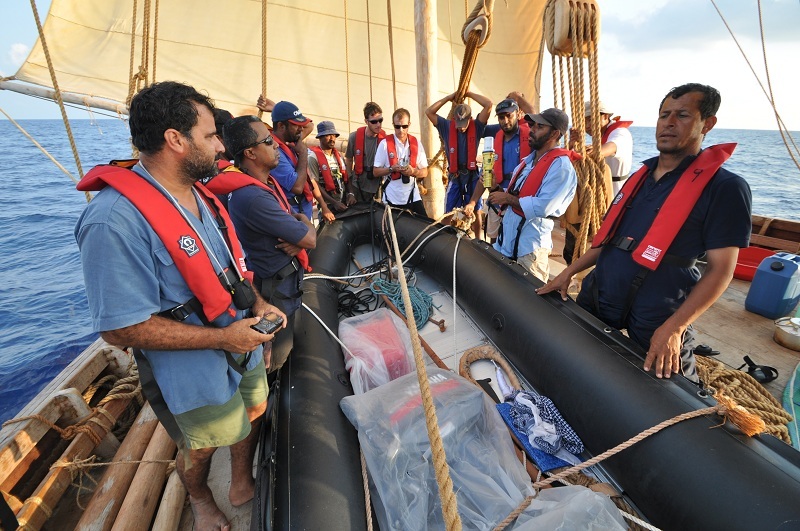 In addition to three life-rafts with GPS radio beacons, we have portable VHF radios, a variety of signal flares, emergency rations, extra water, and medical supplies–all of which go into the life-rafts. In addition, each crew member is required to wear a safety harness, life-vest and personal radio beacon when on deck at night and during rough weather. Captain Saleh insists on safety first aboard the Jewel of Muscat. It’s not much fun to don all of this gear when one’s watch is called at 0400, but it’s one of the important ways we can help ensure that the ship and its crew arrive safely in Singapore. Excitement is building as we look forward to sighting the Laccadive Islands sometime in the next few days.